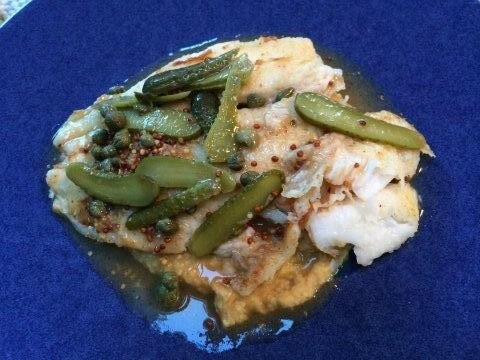 This week’s recipe for French Fridays with Dorie is skate with capers, cornichons, and brown butter sauce. First off, I’ll be honest. I didn’t make this recipe with skate. They didn’t have it at the fish counter at Whole Foods, and I didn’t have time to go hunting. I anticipated that skate might not be available, so did a little research on alternatives before I went to the store. Suggestions were all over the map, from meaty fish like shark or halibut to delicate fillets like tilapia and flounder. 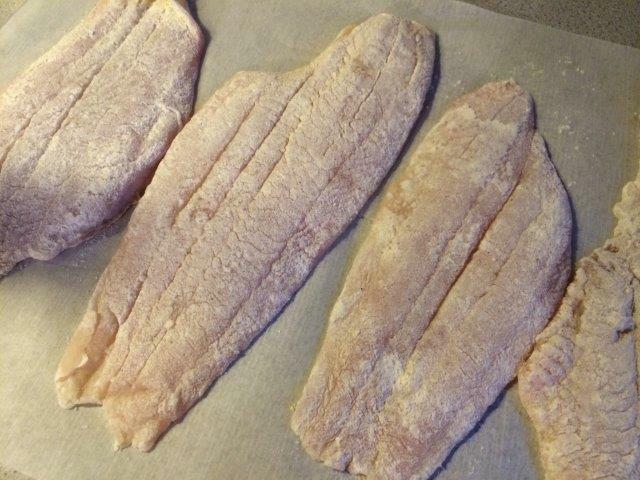 In the end, I selected flounder fillets because they offered a similar cooking time to the instructions for cooking the skate. I loved this preparation. Just as when we made the almond flounder meuniere, after I made this dish, I was scratching my head and wondering why I don’t remember this quick pan-fry technique more often for weeknight dinners. Simply pan-frying the fish in butter provides a savory palette for any sort of sauce you’d like. This recipe’s piquant sauce was a definite winner. The nutty flavor of the butter added depth, the capers and cornichons added salt, and the vinegar a pronounced tang. I’d say the tang was strong on the first bite, though not unpleasant. It grew on you before you swallow. Dorie suggests serving this on a bed of something creamy like mashed potatoes. I made one of my favorite side dishes, Spiced Chickpea Puree, which is like a warm hummus without the tahini. I share the recipe below. I’ll definitely be making this again. Even though it’s easy enough for a weeknight, it’s also special enough to serve to company. If I spy skate at the fish counter, I’d try that as the base, but who knows when it will make an appearance. To see what the other Doristas thought of this fishy dish, check out their links here. You can find the recipe in Dorie Greenspan’s book Around My French Table. Drain the chickpeas and rinse well. Place them in the food processor. Puree just until smooth, adding water as needed. Add cumin, lemon juice, garlic oil (or oil and garlic), and cayenne. Pulse to combine. Adjust seasoning. Heat a medium-sized skillet over medium heat. Add the chickpea puree, and gently heat, stirring frequently, until warm. Stir in chopped parsley before serving. Posted on 20 June 2014, in French Fridays with Dorie and tagged chick peas, flounder, French Fridays with Dorie. Bookmark the permalink. 12 Comments. The pan frying technique for fish is excellent and I, too, was reminded of that. It’s perfect for white (non-fishy) fish and this sauce was pretty darned good too! This looks fantastic! Before I even saw it was from cooking with Dorie I immediately noted the French influence. 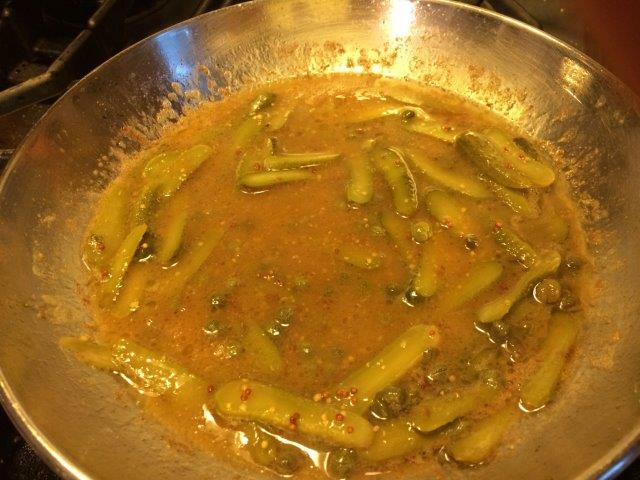 I used to prepare a similar chicken dish using the cornichons, capers, vinegar combination and love that burst of flavor combination! Thanks so much for sharing! Beautifully done, Betsy! And your chickpea puree looks like a winner, too! Thanks for the chickpea recipe. One of my favorite weeknight sides is mashed canned white beans and your chickpea recipe looks similarly quick and easy. I’m noting it down for future ues. Your fish looks delicious, and that chickpea puree is a great idea! I’m with you, I think this is a great technique that when I make something like this, I wonder why I don’t more often! I’m happy that you’re having a great trip! Maybe we’ll hear a little bit about your adventures. Enjoy your vacation. Your meal looks great. Delicious looking meal, Betsy!! I would love the chickpea puree…sounds like it pairs perfectly! Hope you’re enjoying your vacation!! The sauce was great, wasn’t it. I tried my darndest to find skate, but no-one had it. Thank you for the spiced chickpea puree recipe. What does it taste like? Maybe a chickpea mashed potatoes? We all chose something different from cod to haibut to sole to talapia. Kathy and Emily get the prizes this week for trying skate (which Kathy special-ordered) and ray. The sauce was to-die-for, I thought. I agree with you – why don’t I pan fry fish more often. I really, really enjoyed this meal. I hope you and Howard are having a great vacation in Cali. We’ve struggled along without you. Not well but adequate. Yes, why don’t we think of dishes like this more often???? The puree sounds delicious. I hope you had an amazing vacation. I loved this one too. I also plan to keep my eye out for skate – it would be fun to try!